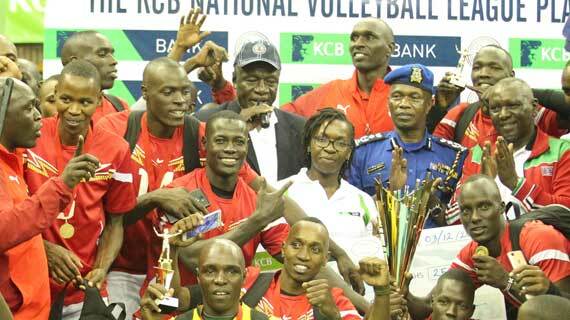 Kenya Prisons reclaimed the women’s national title while the General Service Unit defended their men’s crown when the three-day Kenya National Volleyball federation (KVF) play-offs concluded at the Kasarani Gymnasium on Monday evening. Both sides came into the final round of matches Monday needing just two sets off their opponents and both sides delivered the crown at 2-0 up with GSU going on to win by straight sets while Prisons who last won the national title in 2013 won 3-1. Prisons were first up in the afternoon finale and charged against a Pipeline side deflated from their 3-2 loss to KCB on Sunday, they were in to make the most of it and claim the win. Prison wrapped up the title quick against their long time rivals Pipeline, winning the first two sets 25-19 and 25-22. Prisons led 8-6 at the first technical time-out. On resumption, Japheth Munala’s girls raced back to tie the scores 8-8 and looked well on course to push the warders to the wall. But Prisons responded with four quick points and eventually led 16-14 at the second technical time out. Impressive skipper Mercy Moim kept her red hot form and was at hand to spike the set winning point after a period of dominance by the warders. Prisons were coasting in the second set and led 8-3 and 16-8 at the first and second technical time-outs. But, Pipeline came into the final third of the set with more vigor and pushed the score to a two-point game at 19-17. Despite the little hope of a comeback, Prisons kept their composure to win the set and ultimately the league title. Approaching the game with a relaxed mentality with the title in the bag, Prisons relaxed in the third set and allowed Pipeline to come back, winning 25-22. Learning from their mistakes, the warders improved in the fourth set despite going down 8-3 at the first technical time out. In the men’s finale, GSU were taking no prisoners as they exerted authority, stinging Prisons with some heavy spikes and winning the game comfortably in straight sets of 25-19, 25-22 and 25-20. KCB ladies finished second and booked a ticket to next year’s CAVB Championship while KDF men finished third in the men’s roaster. Winners walked home with 250,000 shillings in cash prize second placed 100,000 shillings while third placed teams pocketed Kshs. 50,000.